This post makes our mouths water. Hungary was our first stop in Europe after a four month stint in Asia. We reminisce a lot about Asian cuisine, especially Taiwan. For more on our Asian addiction check out our post on the best soy milk restaurants in Taipei! But as much as we loved the grub in Taiwan, Budapest, Hungary, has a special place in our tummies. 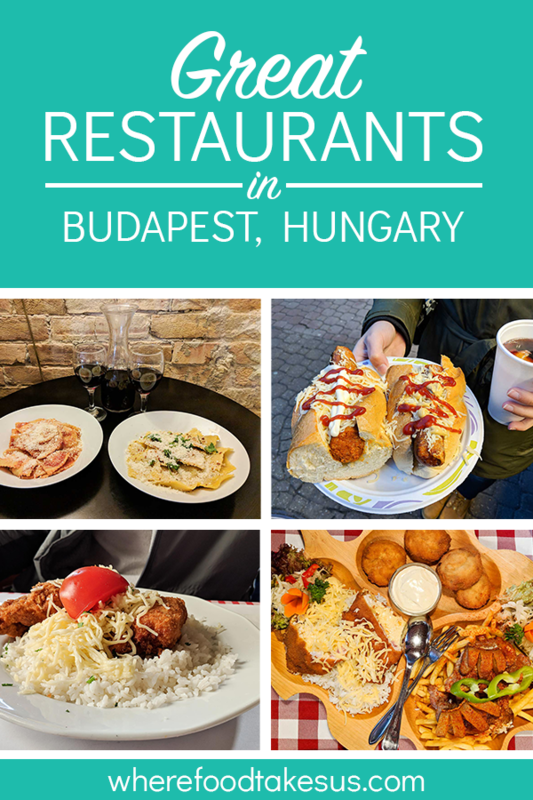 In this post we list some of our favorite restaurants in Budapest. Some are very cheap, some aren’t, but all are delicious. Arguably our favorite place to eat in Budapest, Drum Cafe has everything going for it. Not only is this restaurant located in the famous Jewish Quarter of Budapest, but it’s also dirt cheap! 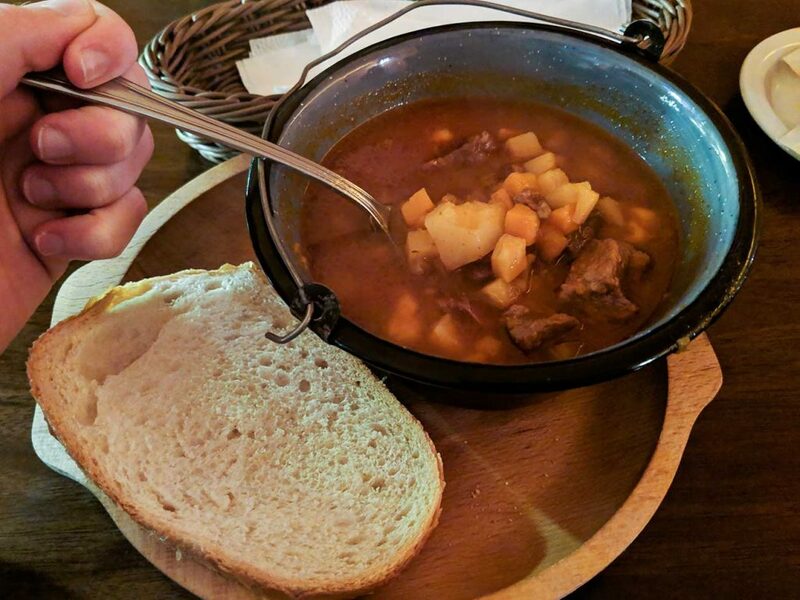 We’re talking a bowl of goulash with bread for a couple bucks (USD). Get outta here! No, don’t actually leave yet. You need to hear about this place. Two floors, a cool staff, and an awesome atmosphere, Drum Cafe seemed like a place for tourists but it never felt like it. Budapest was freezing cold when we visited in January but Drum Cafe was warm and cozy. Their house wine was around $2 USD for a large glass; their coffee was a dollar. 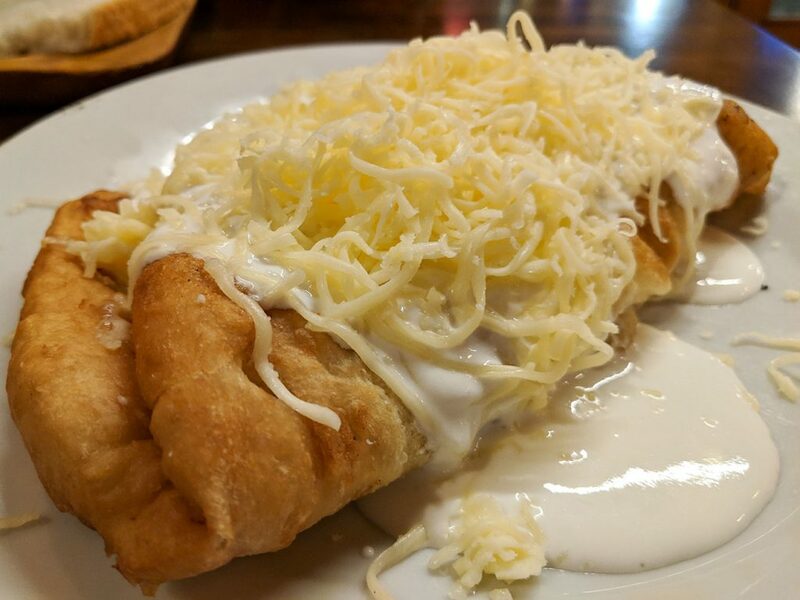 They don’t just serve goulash; a huge helping of lángos (fried bread with filling) costs around the same. 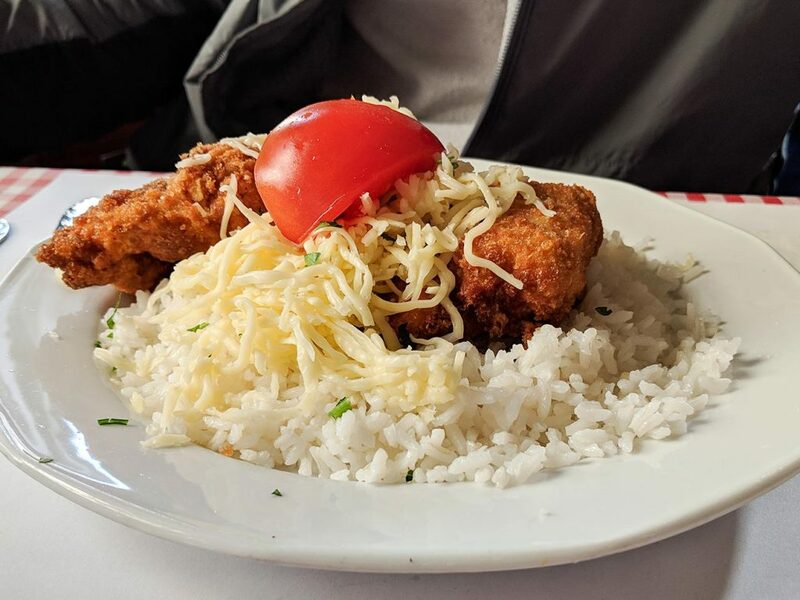 We could go on about how awesome the price is but what makes this place special is the great service and the simple but delectable Hungarian dishes they serve. If you’ve visited Budapest but missed this restaurant we feel sorry for you! If you’ve yet to go to Budapest then make sure this is one of the restaurants you try! This Italian restaurant is located in the famous Gozsdu Udvar courtyard, which is also located in the Jewish Quarter. You’ll find restaurants in the area like Jamie Oliver’s Pizza and so on. Jamie seems like an awesome chef but we’re in Budapest, Hungary. We want something unique. 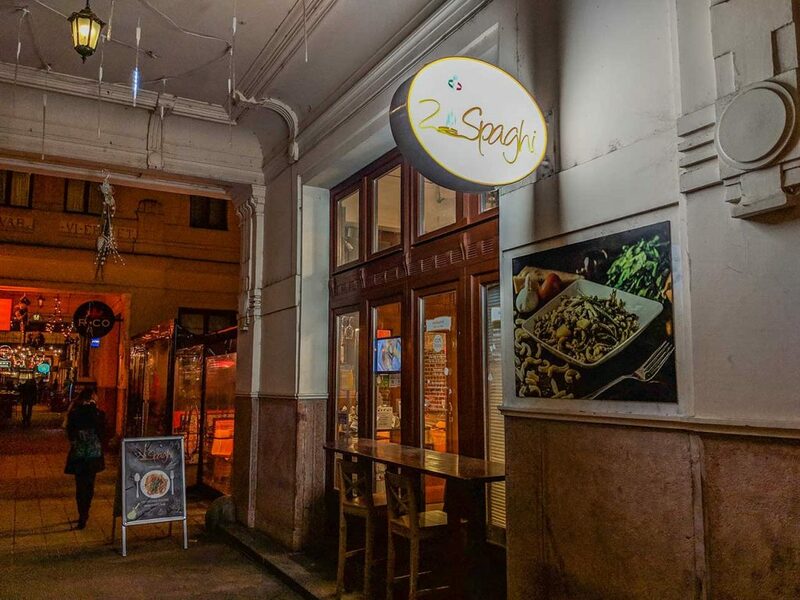 Luckily, while exploring this area of the Jewish Quarter, we stumbled upon 2 Spaghi, a simple Italian joint run by very friendly Italian people. It’s not Hungarian cuisine by any means, but this turned out be one of our favorite restaurants in Budapest. Who can say no to authentic Italian food, wherever they are? 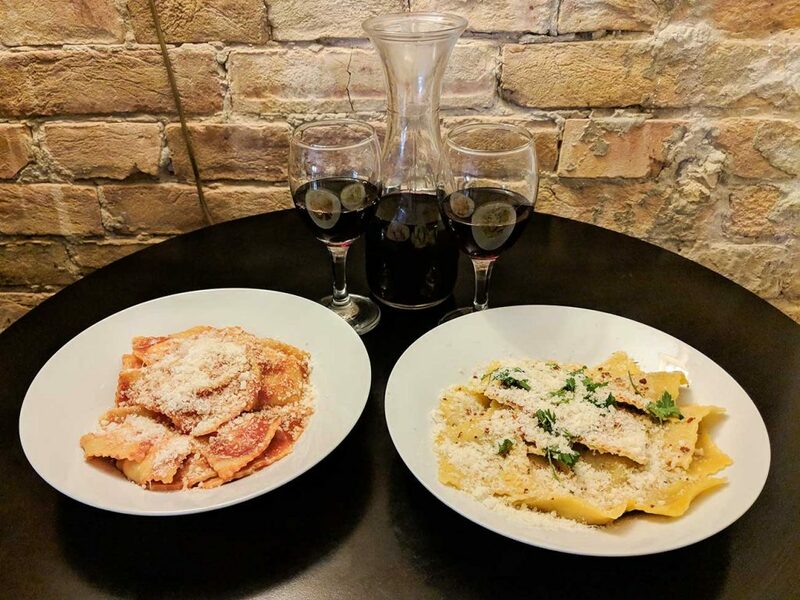 The ravioli menu changes often but we chose the ham and ricotta ravioli paired with a tomato and basil sauce and braised beef ravioli with aglio, olio, e peperoncino (garlic, oil and pepper). Or There’s some homemade pasta with your choice of sauce from pesto to ragù. You won’t leave dissatisfied. This restaurant costs a little more, ranging from $6-$10 USD per person. However, considering the restaurants around it, this is a steal! We shared some of their house wine to make it a perfect Italian meal. Many people came in while we were eating to grab some of that homemade pasta to take home an cook themselves. While we didn’t do that (a big mistake on our part), you should try it! When you’re in a foreign city for the first time, have nowhere to go and you’re hungry, you begin to get desperate. It was our second night in Budapest, a little outside of the city center near our Airbnb, and it was so cold! Oh, it was also just after Christmas. Most things were still closed for the holiday and the city seemed somewhat abandoned. 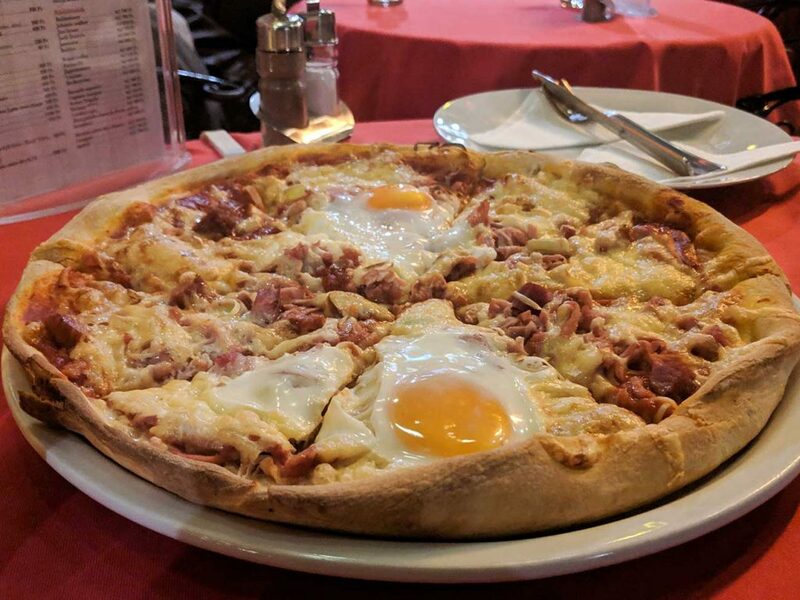 However, we found one of the best pizza and burger restaurants in Budapest called M35 Vendéglő. This was a non-touristy area but our waitress spoke English, was excited for us to be there, and waited on us hand and foot. In addition to her friendliness, the pizza was delicious and a half liter of beer wasn’t even $2 USD. 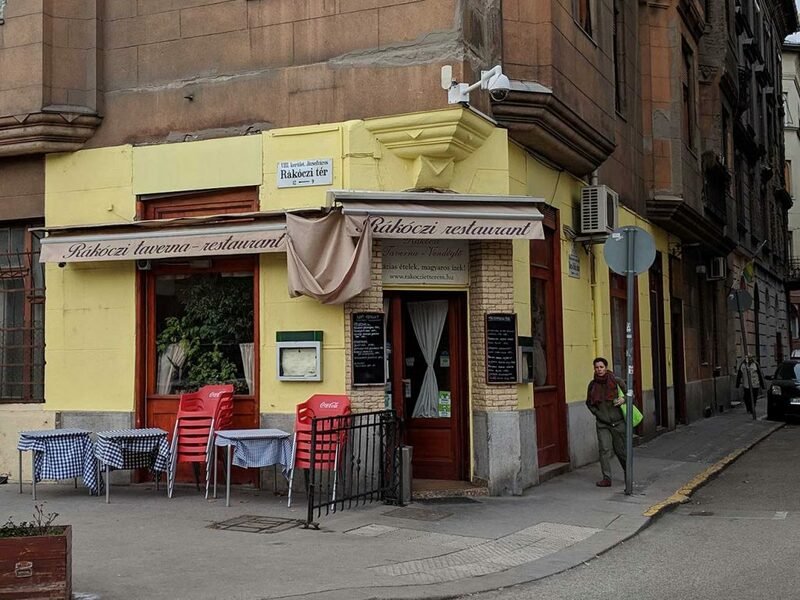 If you need a cheap eat and are outside of the center of Budapest, give M35 Vendéglő a try. They’ll be excited you came, and you will be too once you’ve tried that pizza! You can find it near the Klinikák subway station on the blue line, M3. Rákóczi Restaurant in Budapest is a win-win, let us tell you why. Not only is there this awesome corner restaurant that serves up great Hungarian eats; there’s a huge local market across the street where you can buy fresh veggies, fruits, wine, cheese, sausage…you get the idea. It’s a fresh local market that you should experience. Check out our post on Rákóczi Market Hall! Ok, back to Rákóczi Restaurant. There isn’t a ton of seating but don’t let that put you off. The cordial staff will see you’re taken care of and the locals who are laughing and drinking exude the welcoming vibe. 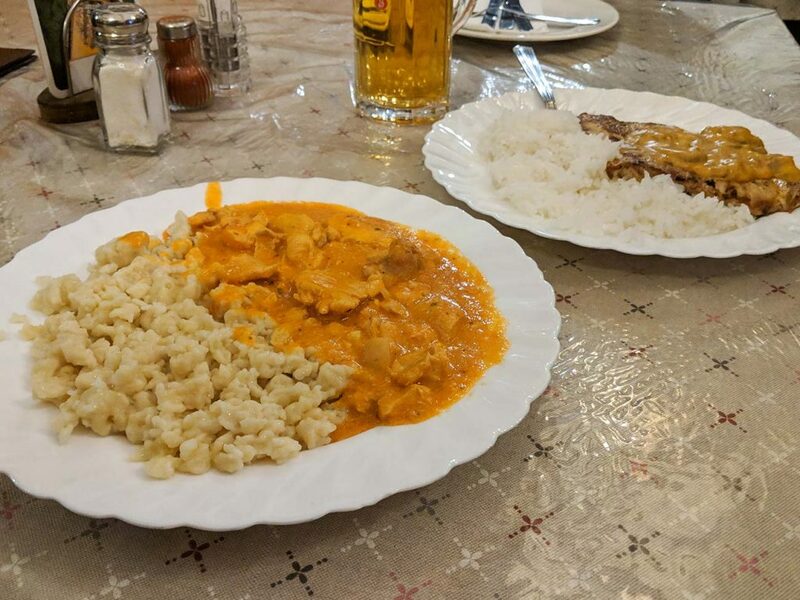 You’ll find dishes here like turkey or pork stuffed with cheese and broccoli, the well known Hungarian dish of Pörkölt, as well as veal and fish. Rákóczi Restaurant, most importantly, is wallet friendly and makes the tummy happy. Leave the city center of Budapest and experience a little more local flare at Rákóczi Restaurant. Rákóczi Restaurant can be found by taking the green line, M4, to the station of the same name. Rákóczi. You can’t miss it! Situated on the edge of the Jewish Quarter, Frici Papa is another classic Hungarian restaurant. There were a few of us foreigners in the place but most were Hungarian. The meals here were really good. We tried the pork with jasmine rice and the paprika chicken with nokedli, the heavenly Hungarian noodle dumplings. That said, the dinner isn’t the reason we’re writing about Frici Papa. Rather, the dump cake. 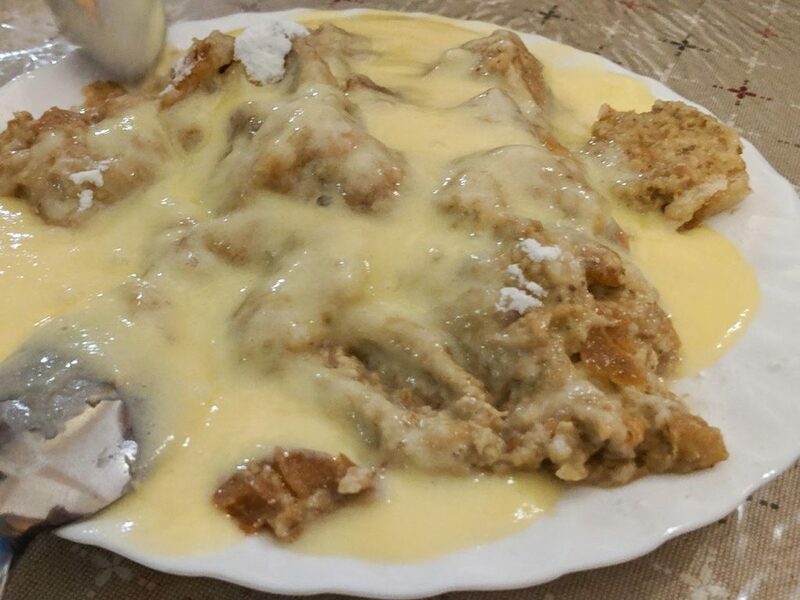 Yes, this was the best dump cake we’ve ever had. It was drizzling with vanilla pudding and begging to be eaten. They called it a vanilla sauce, but we think it’s thicker like a pudding. Even if you’re full, hop over to Frici Papa for some warm and sweet goodness. Tüköry Étterem is special, there’s no doubt about it. You can find this gem of a restaurant just behind the American Embassy, near the famous Liberty Square. We highly recommend you check out Liberty Square for some great history of Budapest. The Hungarian Parliament building is also nearby and its architecture needs to be appreciated. 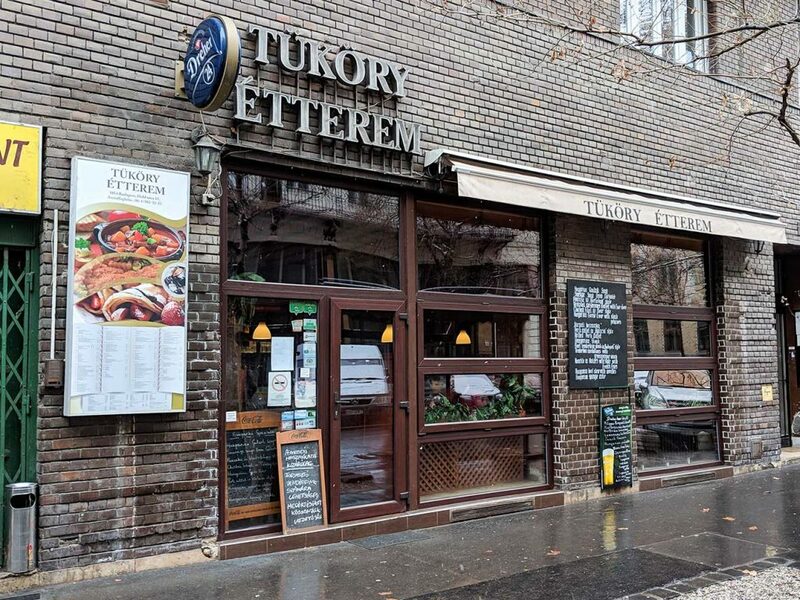 However, you’ll find some great Hungarian food nearby at Tüköry Étterem, just east of the Liberty Square on Hold Utca (Hold Street). Tüköry Étterem was warm, pleasant, and most of all, delightful. Our waitress was so friendly and patient with us. It took us forever to make a decision! An aside…this was the case for the all the wait staff in restaurants of Budapest! There were more tourists here but not enough to quell the Hungarian vibe. We shared a “wood platter”, which consisted of fried mushrooms, ham and cheese stuffed chicken on rice, grilled lamb neck fillets, Hungarian fried bacon (whoa! ), and french fries. We also tried the Hungarian national liquor, Pálinka. It’s a fruity brandy that comes in several flavors. It stings but it’s a great finisher to a meal. This wood platter was a monster but we didn’t have any trouble devouring it. Please try Tüköry Étterem if you have the chance. Not only are there some great Budapest sights nearby, there’s also some exceptional food round the corner. This isn’t tied to a specific restaurant. 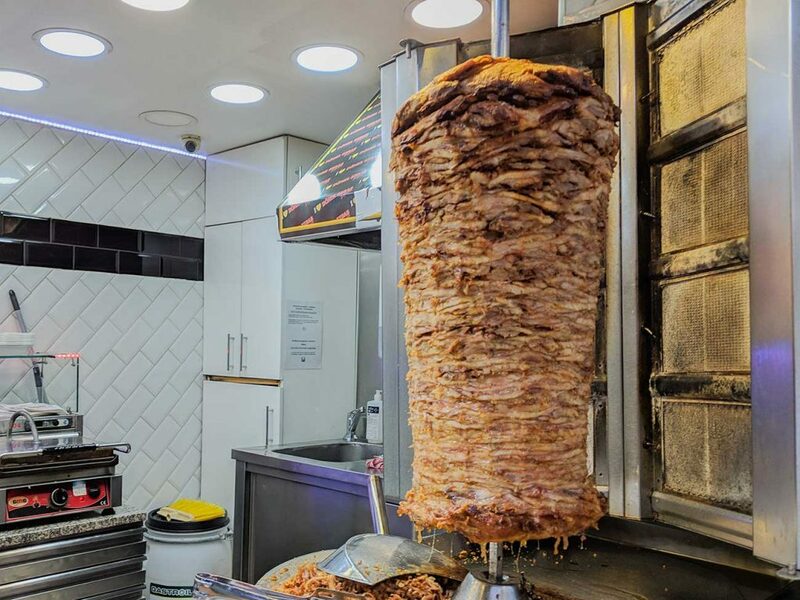 You can find gyro stands everywhere in Budapest. You can find them in most places in Europe, actually. 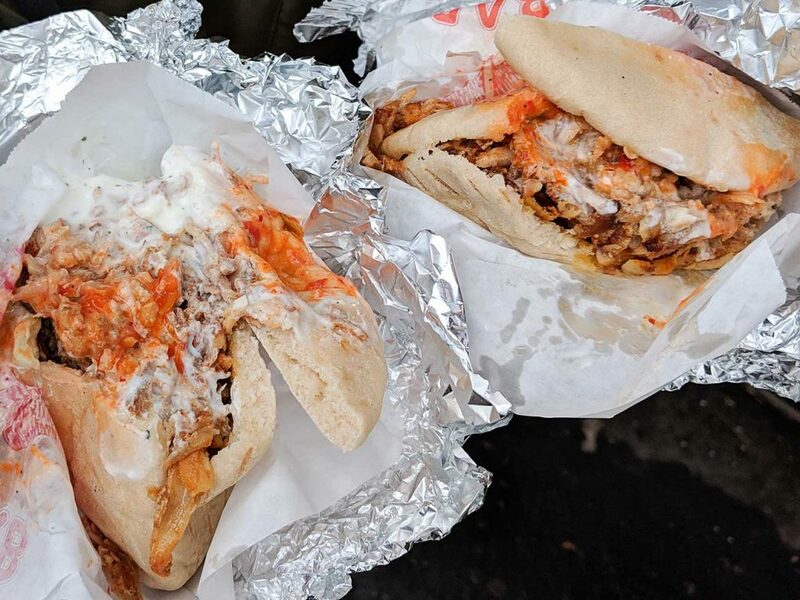 However, we would like to mention Mester Gyros. Again, we were new to the city around Christmas and New Year’s, and Mester Gyros was one of the few restaurants in Budapest with its doors open. Holy gyro, batman! This place was delicious. For less than $4 USD you can get a plate full of gyro, tzatziki, spicy sauce, lettuce, relish and a soda. The indoor seating was nice, given it was so cold outside. However, they offer outside seating. 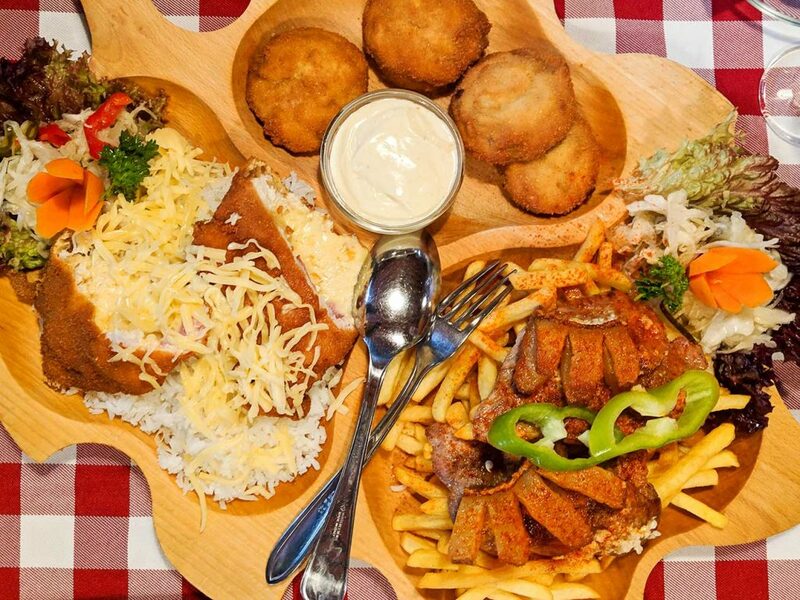 If in Budapest in the warmer seasons, a full plate of gyro on the city sidewalk sounds mighty nice to us. 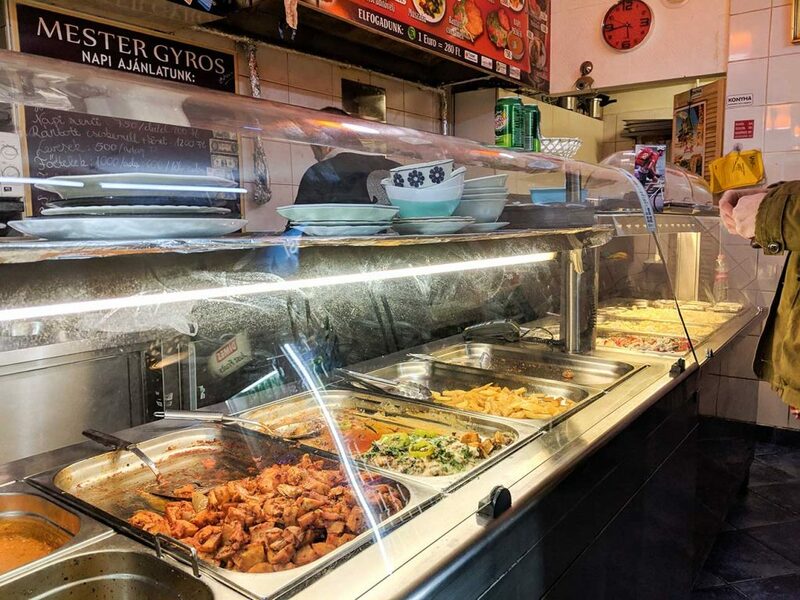 If you can’t try Mester Gyros, be sure to stop by one of the many gyro stands around Budapest. Your wallet and your taste buds will thank you. Last but not least, the Christmas Market in Budapest is a must. This, of course, requires timing your stay in Budapest around the holiday but if you can manage it, we behoove you to do so. 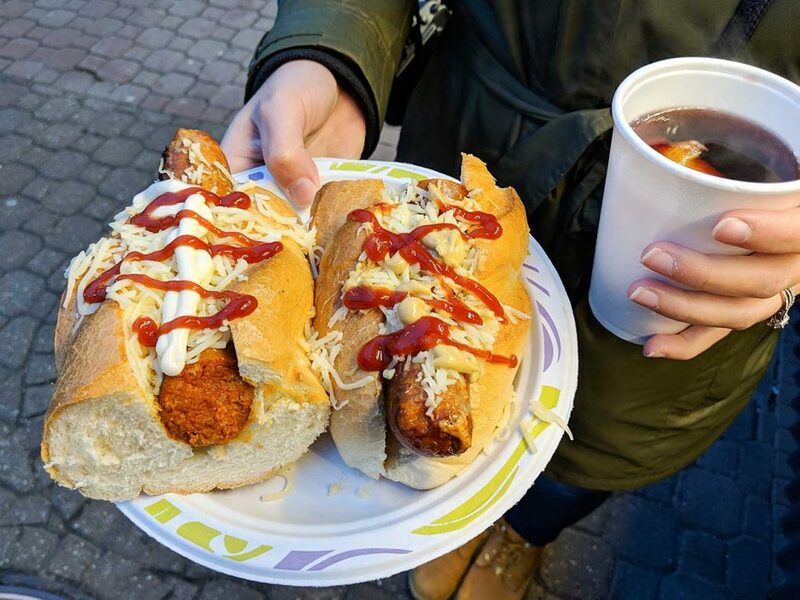 Mulled wine, goulash, sausages, lángos, potato pancakes, chocolate, chocolate, and more chocolate, the Christmas Market in Budapest is beautiful, vibrant, and memorable. A small amount of vendors stay open after Christmas passes, like Cafe De Paris Kft in Vörösmarty square, which is open year round. This stand is probably overpriced, being so close to the tourist shopping area, but if you’re in the mood for mulled wine and savory sausages then it’s worth it! It can be a tasty substitute for missing the Christmas market and it’s okay to splurge on the good stuff. 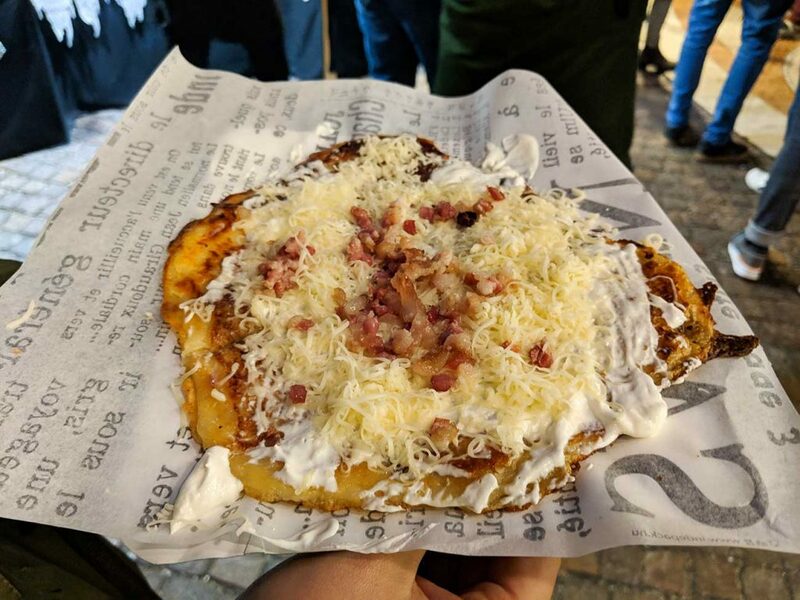 This isn’t technically one of the restaurants in Budapest we’d recommend, as it’s more like a street vendor, but it sure is yummy! We hope these restaurants have provided you with some good information about what eating in Budapest is like and what it will cost. 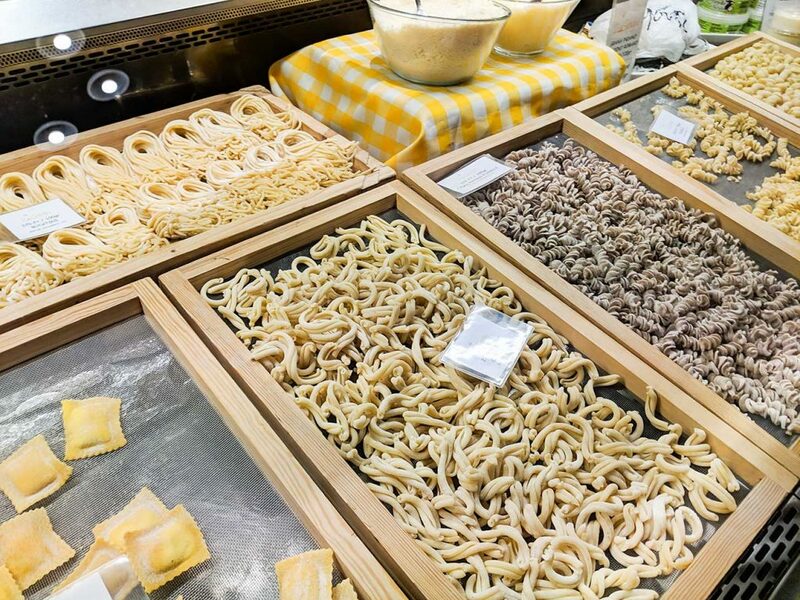 Our main goal when we travel is to stay away from the touristy restaurants and focus on more local cuisine, whether it be the night markets in Taipei, Taiwan, or goulash in Budapest. If you have the chance to visit Budapest then you’re in for a treat. Not only is there some wonderful history in this enchanting city known as the Pearl of the Danube, but there are countless ways to satisfy the hungry traveler in you. 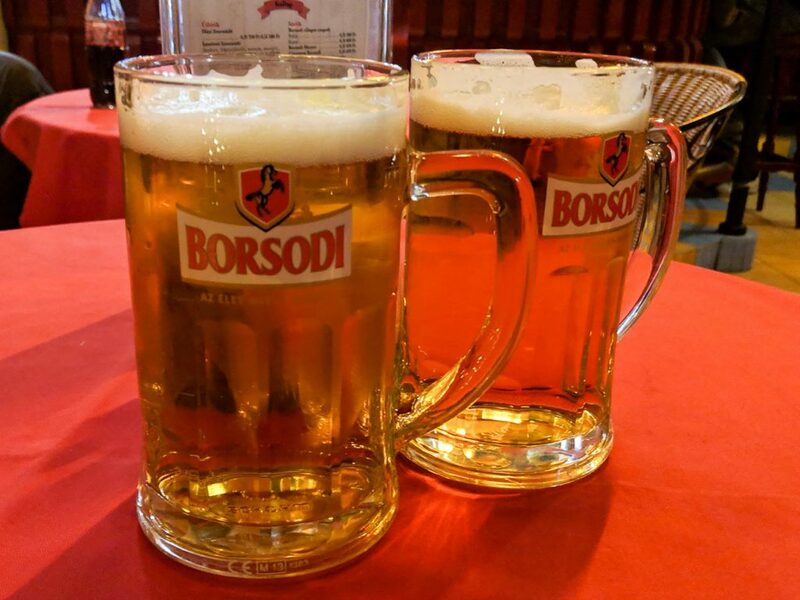 If you’re full of Hungarian food and would rather kick back and just have a cold one, check out our post on our favorite ruin pubs in Budapest for a unique night out! Note to self: don’t browse a food post when hungry! Aw man… now I want to eat everything on this page! Looks delectable! I never knew that Hungarian cuisine had such a range, not that I profess much knowledge on the subject. But the restaurants you have covered really offer a great choice. But I guess being vegetarians our choices are bound to be limited. My pick from these restaurants too is 2 Spaghi, it sounds really cozy for a comfort meal or two. I prefer to eat local food on my travels. I am pescetarian and sometimes it can be hard to find good local food that suits my taste well. Especially in countries like Hungary where the cuisine is based on red and white meat. But I can remember a good paprika fisherman’s stew i had in Budapest several years ago. 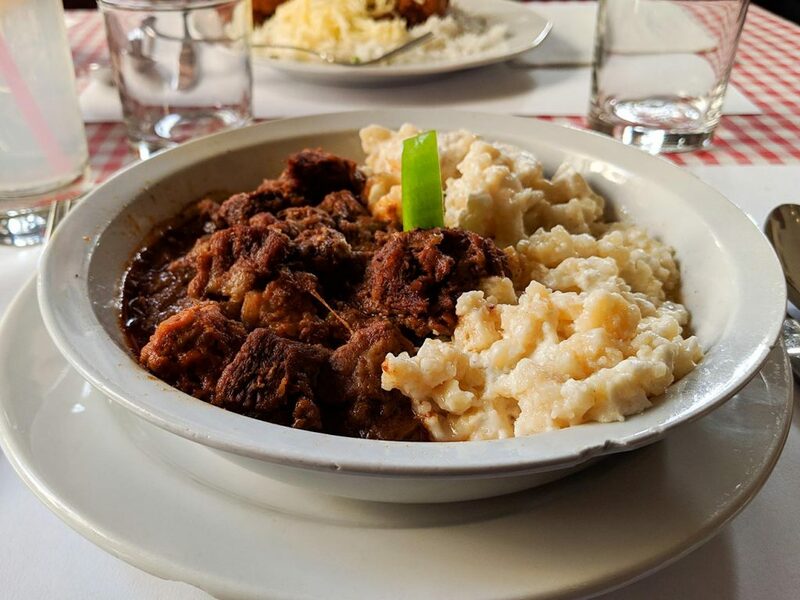 I bet the stew can be found at one of these classic Hungarian restaurants you have mentioned! You post is making me feel hungry even though I recently had lunch! God, how I miss eating a well-prepared goulash! We were there for the Christmas market and the mulled wine was ok. So far, the best mulled wine has been in Bratislava. 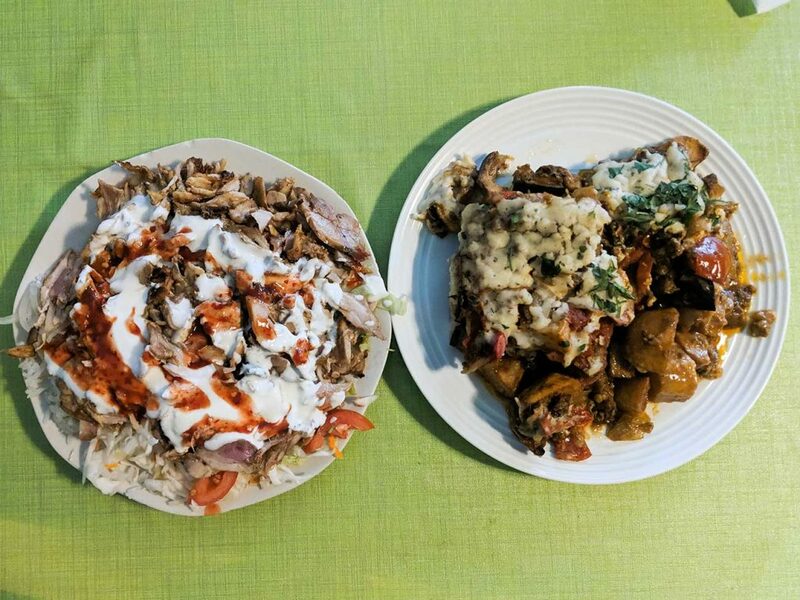 I have not had the chance to go to Hungry as of yet, and I can tell from this post that I am totally going to love trying all the different foods and checking out these restaurants! Pinned! Budapest had some really amazing restaurants that served food from different cuisines all over the world! We really wouldn’t miss out on this. Ok, not fair. I am now really hungry. I think the Italian place is my favourite. Great food shots! The Italian joint is always our favorite. Not really, but we do love Italian food! Couldn’t make this list without it. We love suggestions! 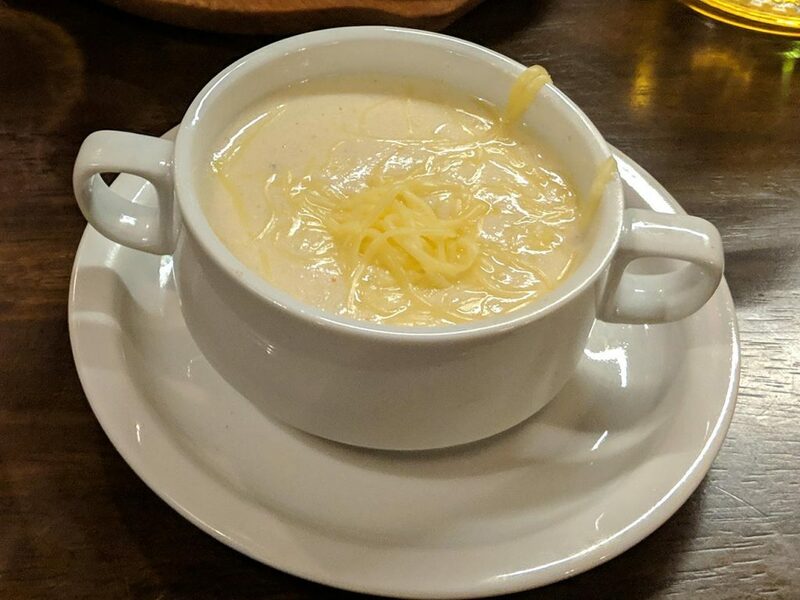 The saucy thing in the cup was a cheese soup…not sure if it was Hungarian but it was delicious! We love Italian food and couldn’t resist trying it and since it was really good we threw it in our post! Thank you for your thoughts!